Focus on the positive things in your life and remind yourself that even when life is challenging, good things are still around you. With a regular gratitude practice you may begin to notice how the challenges in life have helped you grow. In October of 2014 I started a daily practice of gratitude. In the beginning it was a conscious daily action to write in a journal to create a habit. Now, my gratitude is sometimes a thought when I first wake up in the morning, a note in my journal or a post it on my desk at work. It’s a daily habit that sets the tone for my day and creates a mindset that makes whatever challenges I face throughout the day less physically and mentally draining. FEEL AND EXPRESS GRATITUDE AS A REGULAR PRACTICE AND YOU WILL SEE YOUR LIFE IS EXTRAORDINARY. Begin each day by writing down everything you’re grateful for in a journal. It’s a wonderful way to start the day and create an overall feeling of contentment and happiness about life. A morning gratitude practice also sets the tone and establishes a positive outlook for the day ahead of you. And, if that isn’t reason enough to develop an daily attitude of gratitude, scientific studies have shown the power of positive thinking can affect our overall health. Stick with a journal if that’s your thing. 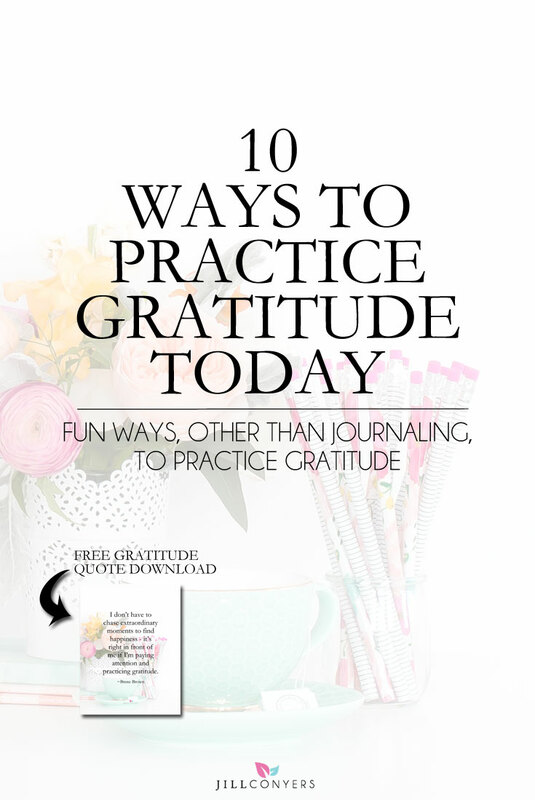 Or, spice up your gratitude practice with different types. Choose two, three, or all of the ideas below. They’re all beneficial, so choose those that most resonate with you, and feel free to “mix it up”. The best gratitude practice for you is the one you will stick with! Start your day with a grateful heart. First thing after you wake up, acknowledge what you’re grateful for. Send a handwritten thank you letter by mail or deliver in person. Practice mindfulness to appreciate each moment. Reach out to someone that changed your life and share your gratitude for them. Donate your money or time to a charity. Spend 5 minutes with your hand on your heart, appreciating you and your life. Notice the beauty of the things you see everyday, a sunset, a sunrise, green grass, flowers and blue skies. Remember the difference between wants and needs. Post words, photos or objects of gratitude around your home. Download the printables below and keep them where you will see them often. Have you started a regular practice of gratitude? What’s the biggest obstacle to staying consistent in your practice? What are you grateful for today? This is a lovely post. Gratitude is a nice attitude that all people must practice. LOVE everything about this post. I try to be grateful most days- even on days which don’t really feel like it. Great advice on practicing gratitude. As my own way of practicing gratitude, I am starting a ‘Thankful Thursdays’ linkup at my blog where bloggers can join in sharing things they are thankful for. There are so many ways to show gratitude. I try to focus on one thing I am grateful for every day. I totally agree about positive thinking and having a great attitude! It is definitely better for our physical and mental health. I try meditating and yoga also helps me a lot? You can’t go wrong with being grateful everyday. I love it because it makes my whole day better. Aside from the fact that it also makes me realize how blessed I am! I think it’s a very good practice and it helps us become more positive in life. It’s always nice to start the day being grateful for what you already have. It makes your day so much better and you’re going to feel less stressed. Awww what a great post! I think those are great ideas. All these are great. I love making the best our of everyday life. Sending handwritten thank you notes is something I’d to practice more often. I’ll admit journal is not for me. I find it quite tedious. I like taking the mindful approach – both in thoughts and words I use with others. This is lovely. I always try to have gratitude. It’s so much easier to be happy than upset. I’ve heard of journaling, but these tips are good too. Thanks for coming to Blogger’s Pit Stop last week. I need to remember the ‘want vs need’ on my next shopping trip! I’m buying too much junk! Great reminders! Congratulations. This post was among the most clicked and will be featured on Friday. Well done. These are really important tips. I need to try to be more deliberate in my gratitude. Gratitude is such a blessing.. Wonderful post. So often people seem to forget to feel thankful for what they already have and spend their time worrying about what they wish they had. They miss out on so much… thank you for some much needed inspiration!! I love this post. Too many people don’t stop to show the gratitude that is due for what they do have. I don’t write down anything like in a gratitude journal. I always just try to remember and reflect on the things that I’m grateful for! Some great suggestions Jill! Years ago I started the practice of counting at least 3 things to be grateful for every night before going to sleep – it helps to settle my mind and always reminds m that there is something good in everyday to celebrate. These are great tips. I think most days everyone needs to step back and say what they are grateful for. Loving these simple and practical ways to practice gratitude. The more it’s practiced, the easier it is to realize that every day is a blessing! An attitude of gratitude is so necessary in this day and age. I’m also reading The Gifts of Imperfection, as I’ve been working my vulnerability this year! 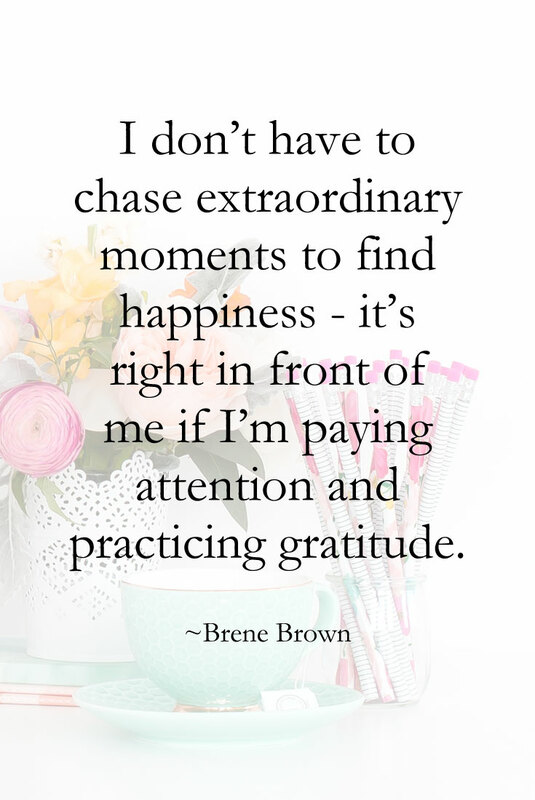 Brene Brown is one of my favorite authors! These are such strong sentiments that I fully agree with. I find that I’ve hardly properly expressed gratitude to anyone other than my husband. My parents know I’m thankful but generally, other than on my wedding day, I could hardly remember the last time I thanked them with all my heart. I know I’m thankful for strangers who say hi and brighten up my day, but I don’t convey it as well. These are definitely areas I need to work on. This is so right up my alley! I think recognizing the huge difference between needs and wants makes us all more appreciative of all that we have. Great post! Today I am grateful that God always provides what I need when I seem to need it. I should really stop worrying! What a beautiful post Jill! I like starting the day thinking of gratitude and carrying it forward! Happy Saturday! I’m all about being more mindful with gratitude. I love the idea of writing a note and sending it in the mail! That’s the best to get real mail! What great options and tips! Starting each day with a smile can be hard but it makes life feel that much lighter if it can be mustered. I love this list, I felt at peace just reading this! I want to do the simple act of putting my hand on my heart for 5 mins…feel my own energy and center love. Those are all amazing ways. I try to do this everyday. Life can always be so much worse and we have to be grateful for what we have. I agree! These are all amazing ways to practice gratitude. i loved going down your list. I do many of those things and wasn’t giving myself enough credit for that. It helped me to understand that I do, indeed, have gratitude! I love the idea of the handwritten note to someone and writing the letter of gratitude. I think writing notes and sending cards is sometimes a lost art in the electronic age. I have a little journal that I write down 3 things that I’m grateful for at the end of the day. Today I’m grateful that I was able to have coffee with a friend who just lost her stepmother. I made a trip to Target. And it’s the weekend! Gratitude even for the smallest things makes your day better. I cannot remember how long I have had a gratitude journal, but suffice it to say it has been a long time. My Mom has always been a fan of ” Simple Abundance, A Daybook of Comfort and Joy” by Sarah Ban Breathnach. I originally had one of her gratitude journals, but now so many years later a simple notebook will do or a simple prayer of thanks. Thanks for writing — you are so right. We need to be practicing gratitude every day. I’m so excited to start implementing these! Especially with the business of the school year, it can be really easy to get stressed and negative. But, I know practicing gratitude with these easy ways will make a huge difference! Thanks so much 🙂 . OH I LOVE THIS!! Gratitude is so important to me. I can attest to it’s power. And as much as I try to keep a grateful heart, I haven’t started a gratitude journal. That’s crazy! I need to get on that. Writing someone a note about how much you appreciate them is one of my favorite ways to show gratitude! And it puts me in such a good mood, too! So many creative ways to practice gratitude here Jill. I like the idea of waking up and thinking immediately something to be grateful for. I took a Positive Psychology class once, and this was one of our assignments – to keep a journal and every night write down three things we were grateful for. The science backing this idea is amazing! I practice gratitude every day when I get frustrated with my kids! Lol. I take a deep breath (leave the room if necessary) and remember they are kids and not adults and I’m happy they’re mine. So many great ways to practice gratitude! I used to write down at night 3 things I was thankful for, but I got away from it. I always begin my prayers with thanking God for such and such. Also, I love that you included to write and send mail. How great of a feeling it is when we receive something in the mail. Hand written letters are so special.